'None else but fear is thy enemy, thy death, disease and distress. Overcome fear and then there is no death, no disease, no distress for thee. 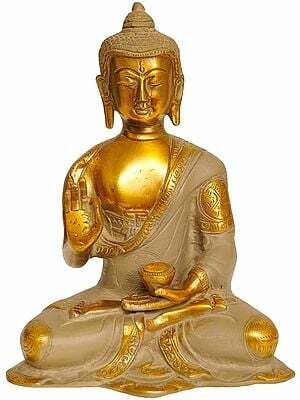 Not death, fear of death is thy problem and redemption from fear is thy redemption from death', said the universal teacher and the compassionate Buddha. 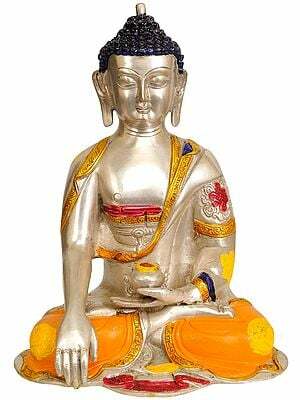 'Abhaya', freedom from fear, is thus the essence of Buddha's philosophy, though different from the ‘abhaya’-related doctrine of other theologies, in India or abroad, in Buddhism ‘abhaya' is not something granted by a divine agency outside oneself, or granted against an outside enemy. 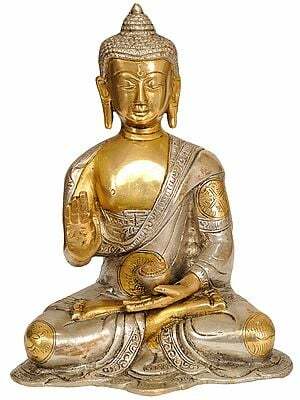 After his long rigorous penance and search within the Buddha realised that fear, which enshrined within oneself, was one’s arch enemy. 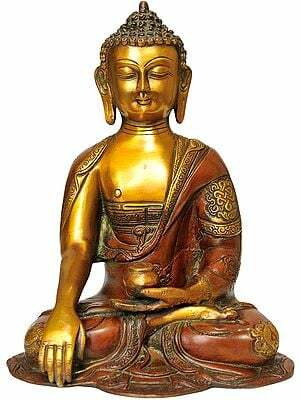 The Buddha hence commanded: ‘Enter into thyself, search thy fear – thy arch enemy, defeat it, and seek thy redemption’. 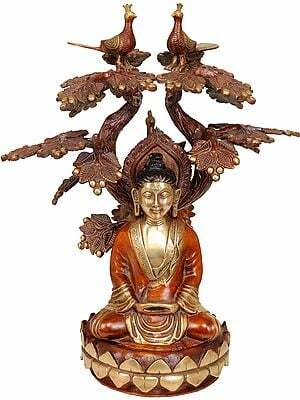 The Buddha does not grant freedom from fear, but only leads the mind beyond it. 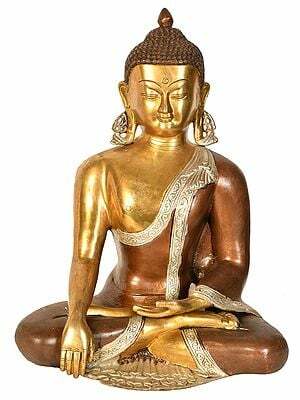 Hence a posture imparting ‘abhaya’ – fearlessness, has in the Buddha's iconography a widely different connotation. 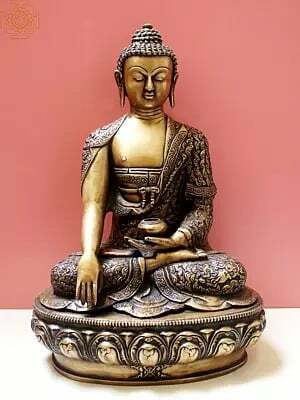 In other sects in India, the deities, while imparting 'abhaya' by one hand, carry in other, or others, different weapons for their devotees’ protection; in the Buddha's ‘abhaya’ imparting icons this other hand is engaged in meditation for it is in meditation that one finds the subtlest weapon for ensuring 'abhaya'. 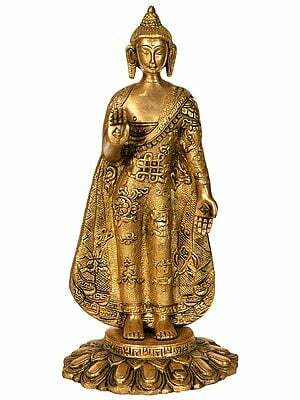 This magnificent brass-cast, a statue of Lord Buddha, unparalleled in its quality, elegance, stylistic versatility and spiritual fervour, represents an intricate form of the Buddha’s iconography manifesting at least his three aspects: meditation or introspection – the search within; teaching or interpreting – leading to light; and, ‘abhaya’ – freedom from fear. The first two aspects relate to the pre-Enlightenment and post-Enlightenment phases of his life, and the third, stretches over both for it was in search of redemption from fear – death, disease and distress, that the Buddha renounced the world; and, it was for guiding people to redeem them from fear that he re-entered into the world. Thus, in Buddhism, the significance of ‘abhaya’ was beyond par. In the Buddhist tradition ‘abhaya’ also defined ‘dhyana’ – introspection, for it was through ‘dhyana’ that one can locate one’s arch enemy, the ‘fear’, and defeat it. 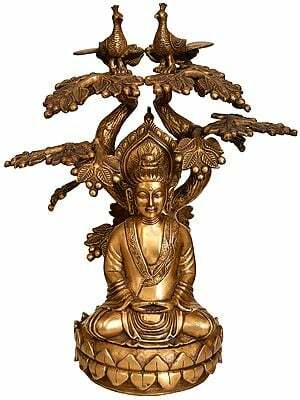 Needless to say that the vision of the Buddha, as illustrated in this brass-statue, is the Buddha’s more accomplished form for it represents the prime objective of Buddhism in aggregation. 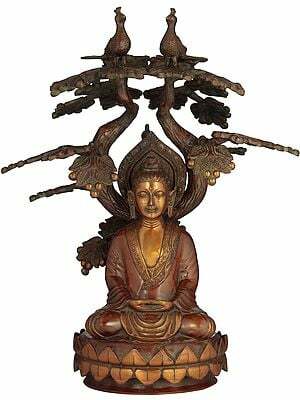 This lofty image of Lord Buddha, rendered as seated cross-legged with feet turned upwards, having appearance of lotus-petals, a posture conventionalised in spiritual iconography as padmasana, is unparalleled in its divine lustre. 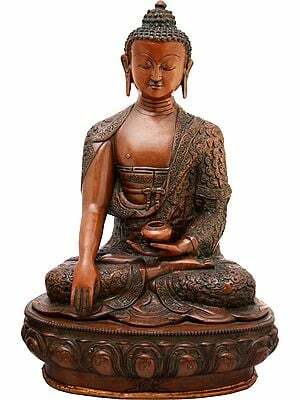 The composure of his face, style of his left hand with its upwards turned palm, largely shut eyes, and sublimity enshrining his entire being are attributes of ‘dhyana’ – meditation. 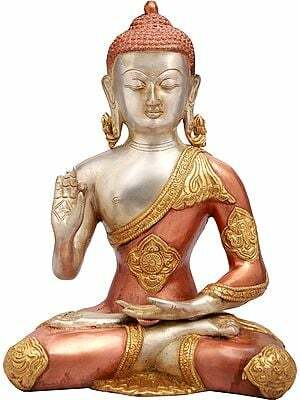 It seems that his realisation has been accomplished and his right hand has ejected as if proclaiming that the path to freedom from fear – ‘abhaya’, has been obtained; and not in words, the light attained seeks to reveal in the twists and curves of his forefinger and thumb. 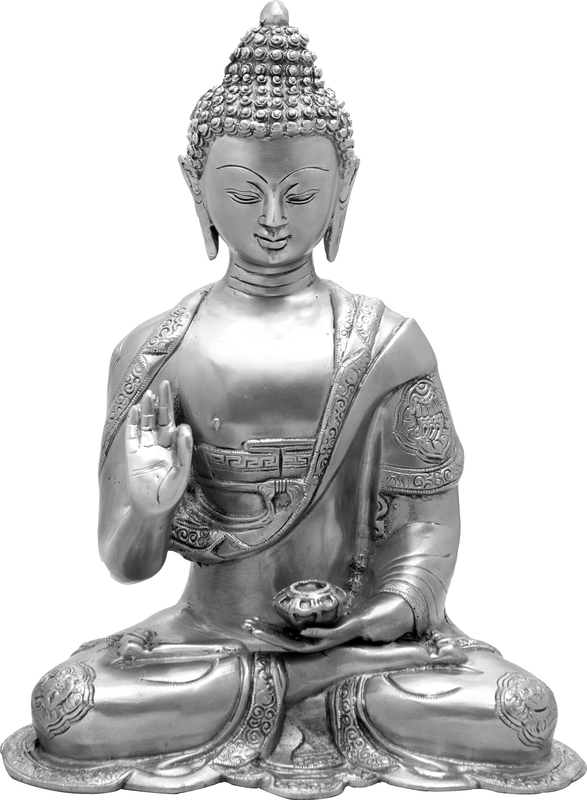 This gesture of the right hand has been conventionalised in iconographic tradition as ‘vitarka’ or ‘vyakhyana-mudra’ – interpretive or teaching posture. The Buddha’s images in ‘vitarka’ or ‘vyakhyana-mudra’ illustrate two contexts of his life : one, the ‘dharma-chakra-pravartana’ – setting the wheel of Law in motion or the first sermon that he delivered at Sarnath to his five prior colleagues after he attained Enlightenment, and the other, when he traveled across the subcontinent to teach, perceived in the tradition as Buddha, the universal teacher. 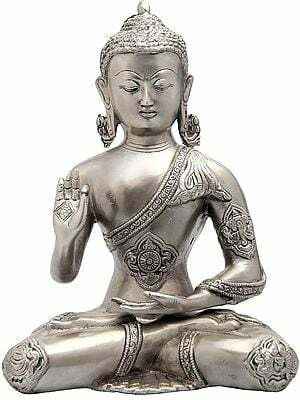 However, while in ‘dharma-chakra-pravartana-mudra’ he has been represented as elaborating his message with the gesture of both hands, not one, Buddha, the universal teacher is usually a standing figure. 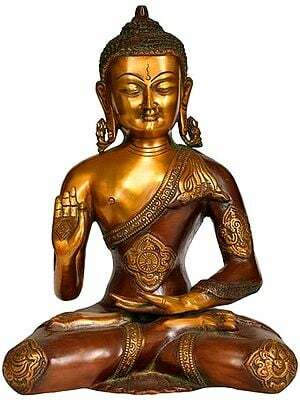 Similarly, the Buddha’s images engaged in penance or meditation as Sakya Muni, the pre-Enlightenment stage, are not only in ‘padmasana’ but also have both hands placed on his lap with palms held upwards. Obviously, this image of the Buddha represents neither of these aspects of the Buddha’s life in full. 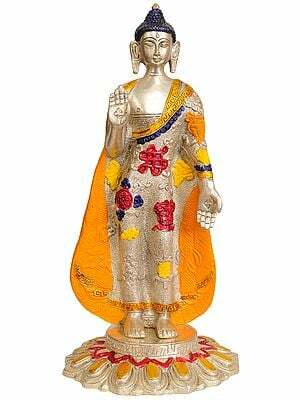 In the image, the Buddha’s right hand is held in ‘abhaya’, though strangely, despite that ‘abhaya’ is so much significant in Buddhism, an image of Buddha devoted entirely to manifesting ‘abhaya’ is rarely seen. 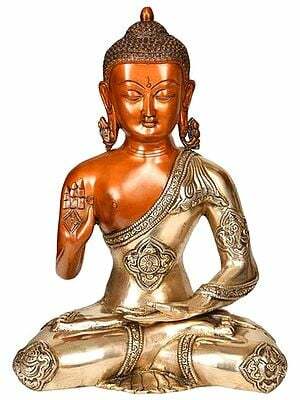 In the Buddhist tradition ‘abhaya’ is essentially the result of right understanding, and right understanding is attained by meditation or introspection, hence their inter-dependence is inevitable. 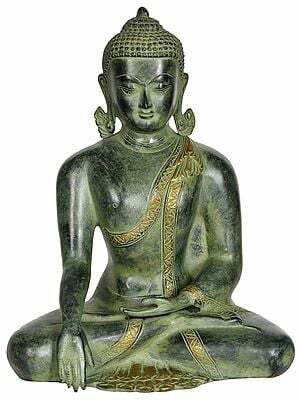 And, this is what defines the Buddhist perception of ‘abhaya’, and the same manifests in this image of the Great Master. 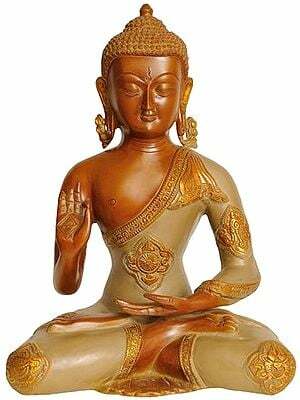 The hand raised in ‘abhaya’ also leads the mind to right understanding which is obtained by meditation, the basic form of the image.